Pepe Reina and Ivan Strinic.have linked up with the Serie A side. AC Milan's new goalkeeper Pepe Reina. PEPE REINA AND Ivan Strinic have completed moves to AC Milan on three-year deals. The Serie A club announced that the signings of both players were sealed on Monday. Goalkeeper Reina and defender Strinic were both available on free transfers after their contracts expired at Napoli and Sampdoria respectively. 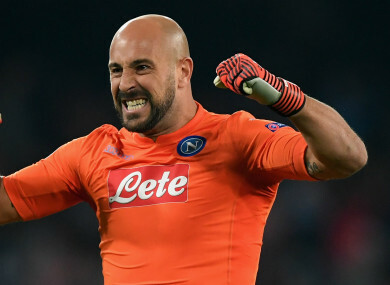 Reina’s arrival is likely to fuel speculation Gianluigi Donnarumma could leave Milan, although sporting director Massimiliano Mirabelli previously indicated this would not be the case if the 35-year-old former Liverpool star did sign. Donnarumma’s agent Mino Raiola has regularly spoken about taking the shot stopper away from San Siro, the teenager having been the centre of a long-running transfer saga in 2017. While Reina’s arrival adds to the goalkeeping options for Milan coach Gennaro Gattuso, Strinic signs from Sampdoria to boost defensive competition. The left-back has been featuring for Croatia at the World Cup, starting three games in his country’s run to the quarter-finals at Russia 2018. Email “Experienced ex-Liverpool goalkeeper completes AC Milan move”. Feedback on “Experienced ex-Liverpool goalkeeper completes AC Milan move”.